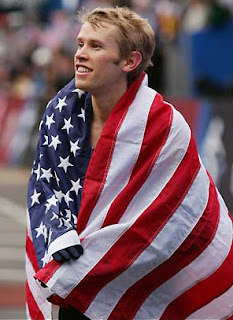 In case you haven't heard, RYAN HALL is running the Medtronic TC 1 Mile! That's our race! Which means I'll get to meet him! Which means I'll probably freak him out when I faint. Ryan Hall. The man who just ran the fastest marathon ever run by an American. Ryan. Hall. I've been too busy announcing this via our social media pages and writing press releases and eblasts so unfortunately my blog is the last place to get any love. OH, Ryan Hall? Didn't catch that the first few time. AMAZING! So excited for you and take lots of pictures! omg. pleeaseeee get a picture with him and share with us!